This month Gulp NT were taken out to enjoy food stories aboard Lloyd Beck’s sailing boat, which is currently anchored in Woods Inlet, near Mandorah. 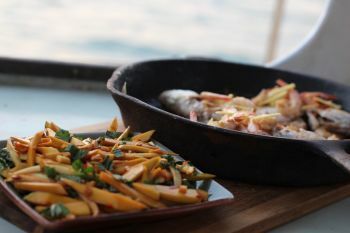 We enjoyed the salty breeze and view of Darwin Harbour over a chat and some great local food as the pink sunset glowed. Lloyd has always loved the sea and, after growing up in Darwin, became a boat captain for the Mandorah Ferry before becoming a crab fisherman. Although he once considered a move to Cairns, he realised that, with its vast and beautiful undeveloped coastal and inland landscapes, there’s nowhere better to live in the world than the Top End. He has since been dedicated to defending these from environmental destruction, spending a lot of time assisting with campaigns and clean ups. His love of food, wild caught fish, gathered fruits, and cooking outside – whether on a fire in the bush or the deck of the boat – reflects his love of the freedom and rawness the Territory brings. This time of year is exceptional. It’s mango season and Lloyd shared a recipe that reminds him of his childhood. “Growing up in Darwin we always loved picking mangoes fresh from the trees. In our place in Parap we had one of the biggest mango trees in Darwin. We would reach off the balcony and just eat them green and crunchy,” he says. “We didn’t have any fancy recipes, we would just dip them in soy sauce – just like that. Over time, Lloyd has been inspired by the green mangoes dipped in soy sauce, adding ginger, chilli and curry leaf to make an amazing salad that goes perfectly with one of his favourite foods – freshly caught fish. “Most of my recipes I just make up. I love cooking and learnt to cook when I left home – just blokes on the boats, so I got into it,” he adds. Peel and cut the green mangoes into thin strips (available in Darwin from September until early January). Mix the soy sauce, grated palm sugar and ginger. Put the mango in a bowl and coat with the mixture. Add the chilli, curry leaf and a squeeze of lime. You can adjust the balance of flavours to taste. Serve with freshly caught fish, steamed in a little water, soy sauce and ginger.